Dirt Genius 19010 Seed Starting Propagation Heat Mat, 17Watt, 8.9" x 19.5"
Bottom heat is one of the most important & effective enhancements to germination & rooting. Our dirt genius propagation Mat warms the rooting area to approximately 10-20˚f above ambient temperature, which markedly improves germination rates & rooting success. It is perfect for placement under a single standard tray. This mat's heavy-duty construction & materials will provide years of reliable service. Dimensions: 19.5" x 8.875" specifications: 17W, 120V, 50/60 Hz, 6' power cord. If you have any questions about this product by Dirt Genius, contact us by completing and submitting the form below. If you are looking for a specif part number, please include it with your message. 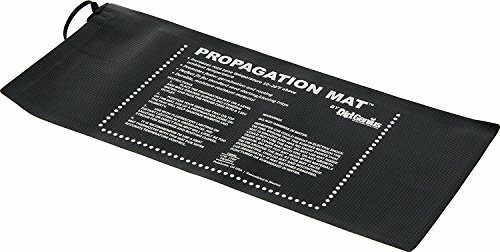 Ultratherm Seed Propagation Mat, 11x17"